As with most great ideas, the concept for a horror writers association originated in the fevered imagination of one individual — in this instance, one Robert R. McCammon. In an interview with Publisher’s Weekly in 1984, the author (who had already published six horror novels) first publicly expressed his desire for a professional organization specifically geared to the needs of fellow writers of fear. 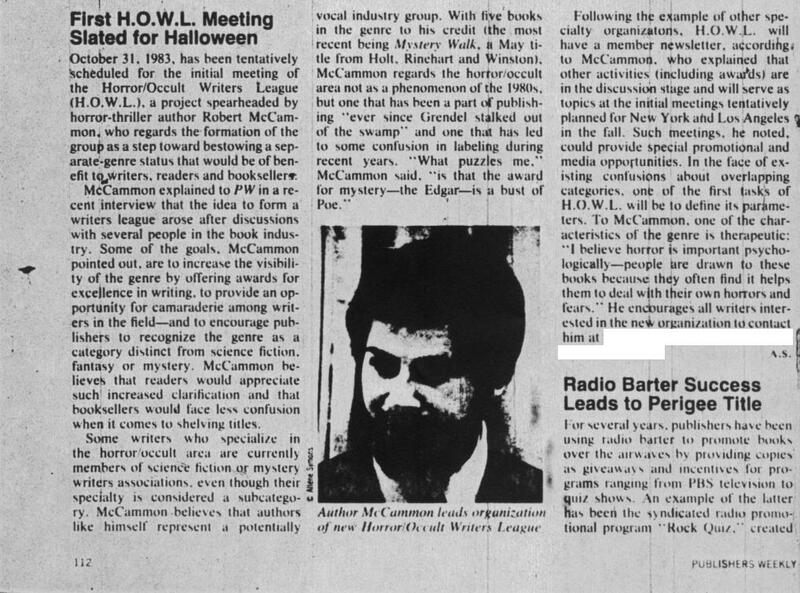 At that point, however, his decidedly colorful name for the then nonexistent organization was “HOWL” (Horror/Occult Writers League.) Even so, reasoned McCammon, mystery writers had their professional organizations, as did science fiction writers. Wasn’t it past time that the equally honorable genre of terror, shock, and the supernatural be formally recognized? Perhaps more than anyone, McCammon was himself shocked at the subsequent — and often sincere — interest from the media to his remarks, including The New York Times and The Washington Post. Then the B. Dalton and Waldenbooks chains wanted to know more. Horror writers began to hear the HOWL and wrote McCammon to ask where to sign up–though it had always been his intent to first survey every writer he could contact before ever making a formal announcement about the proposed organization. Nevertheless, McCammon was deluged with still more letters of support from writers, editors, and scholars both stateside and overseas … my own enthusiastic response as a self-styled “horror journalist” included. 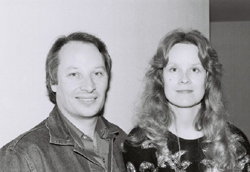 Before long, McCammon enlisted the support of two colleagues from Texas who were instrumental in bringing the concept of HOWL snarling into reality: author Joe R. Lansdale and his wife, Karen. They in turn sent out a formal letter of invitation to some 177 writers, of whom 88 subsequently responded with suggestions or a willingness to join. Working by phone and letter with McCammon, the trio committed themselves to the insane task of creating what they believed could be a nationally — perhaps even internationally recognized — writers organization. Thanks primarily to Karen’s unflagging energy, they then drew up the constitution and bylaws, formulated mailing lists, took out ads, issued press releases; whatever it took to insure that HOWL would be (hopefully) immediately recognized as a professional writers organization, not “a fan club” for side-show horror buffs. Other new volunteers contributed in numerous ways, most notably in the production and content of the early newsletters. We took our organization seriously — right from the bloody start. And why not? Stephen King and Peter Straub, among others, were becoming increasingly known as “brand name writers.” For the first time “Horror” was being labeled as a separate category in most bookstores. The entire field was riding a growing wave of popularity in the Eighties; it was only logical that those of us exploring this increasingly recognized genre would desire to have our own legitimate organization. The lack of high profile authors like King was one of the stumbling blocks early on, even as the organization was searching for recognition by its peers precisely among those most successfully working in our genre. (Dean Koontz and Robert Bloch were among the very first to respond favorably to the concept and to volunteer their aid and reputations.) Regardless, new members from all across the country — and overseas — were being added to the growing roster. And it was obvious from the burgeoning newsletters that, for many writers, editors, and critics, the fledgling organization was being taken quite seriously. 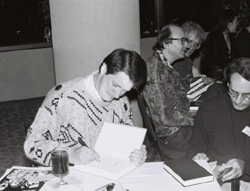 Nevertheless, history was made when the first formal meeting took place on November 3, 1985, at the World Fantasy Convention held in Tucson, Arizona. (Subsequent meetings have taken place at both the World Fantasy Convention and the World Horror Convention ever since.) A total of no more than two dozen people attended that fateful meeting, lead informally by founder Robert R. McCammon, and Joe and Karen Lansdale. Of course, there were literally hundreds of writers, agents, and other professionals at the convention. Dare I say it, there yours truly took note of the small number of the faithful in attendance that glorious Sunday morning. And so made a brief yet heartfelt speech imploring those present to change the name from the undeniably memorable “HOWL” to, say, the “Horror Writers of America.” With the obvious intent to bring our name recognition to the public more in line with such well established groups as the Mystery Writers of America and the Science Fiction Writers of America. By unanimous vote, this small suggestion was approved. Through the volunteered help of legal counsel Sheldon R. Jaffery, the HWA was legally incorporated in March of 1987. The initial board of trustees was also in place, which included at that time McCammon, Lansdale, and Koontz. The HWA was formally on its way, anxious and ready to make its unique voice heard. 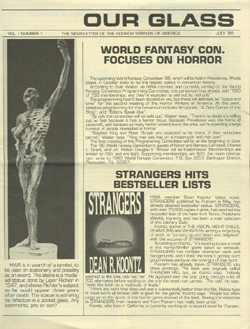 Koontz was instrumental in furthering the idea that the Horror Writers of America was a serious organization for writers, and damn well should be taken seriously by all concerned. Before he left office, there were some 300 members. With many of them are among the most popular and respected authors in the business. (As most everyone is aware, the most recognized horror authors in the world have since become members, including Ray Bradbury, Stephen King, Peter Straub, Clive Barker, Richard Matheson, Ramsey Campbell.) Indeed, Koontz’s considerable contributions to the newsletter alone would help any writer thrive, no matter what the genre. It was also under Koontz’s administration that the formation of an annual award for “Superior Achievement” was initiated. At the time, Koontz was chief among those who believed the award be named after a famous — and deceased — writer. His short list of dead-on recommendations: Mary Shelley, Edgar Allan Poe, H.P. Lovecraft — and Bram Stoker. The membership ultimately voted on the “Bram Stoker Award,” to be issued in the form of a magnificently wrought haunted house designed by Stephen Kirk. Charles L. Grant ably succeeded Koontz as president (as he would be succeeded by such acclaimed authors as Chelsea Quinn Yarbro, Craig Shaw Gardner, Dennis Etchison, Lawrence Watt-Evans, Brian Lumley, Janet Berliner, S.P. Somtow, Richard Laymon, David Niall Wilson, Joseph Nassise, Gary Braunbeck, Deborah LeBlanc, and Rocky Wood). 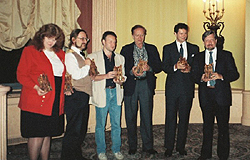 In 1988, the first Annual Bram Stoker Awards Banquet and Business Meeting took place in New York City. Since then, the officers have attempted to satisfy both the West Coast and East Coast members by swapping coasts from time to time. In 1993, to further involve its international membership, the name of the organization was changed once again, from the “Horror Writers of America” to the “Horror Writers Association.” Whatever the name, the horror genre it proudly champions continues to be further recognized and increasingly appreciated as we approach the millennium. Just as the HWA continues to flourish — and be taken seriously — by both publishers and the public alike. This article originally appeared in Writing Horror: A Handbook by the Horror Writers Association, edited by Mort Castle. Copyright © 1996 by ShadoWind, Inc. Used with Permission.